Air Mobility Command's mission is to provide global air mobility. The command also plays a crucial role in providing humanitarian support at home and around the world. 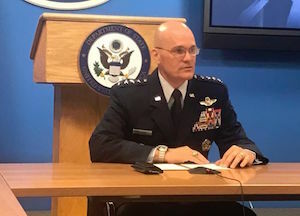 General Everheart II stated that Incirlik Base in Turkey is vitally important that offers U.S. an additional ,besides where Air Mobility Unit has a tanker beddown and ISR. It allows U.S. additional platforms to be able to use to execute operations.In addition, General Carlton Everhart II thanked Turkey for allowing U.S to use Incirlik Base for the major operations. General Everheart II indicated that they have overcome now just through airspace cooperation, to make sure they conduct safe operations. “The logistical support, because of time and distance and the tyranny of distance. Now, we have a great – and I can say, we’re in countries all over the world, and we have a great support mechanism that we use through our logistics apparatus that we have in Air Mobility Command. So as we bring in forces, as we pre-position supplies, we’ve got to make sure that it’s done in a timely manner to sort the war fighters’ needs at a time of need. “ General Everheart said. General Everheart II also highlighted that when AMC fighters demand what if it’s munitions or fuel or food or supplies or humanitarian assistance that they have those needs and they meet those needs in a timely manner. General said President Trump is a businessman and looking it from a financial standpoint and President Trump expects NATO members work together closely. "Air Mobility Command provides: logistics, support, and then also with a great partnership with the nations in Europe make sure work together .We’re fully supportive of our NATO partners. we’ll always be a vital partner to them.” General added. - We are in 77 locations 23 countries. -Mobility airmen are definitely actively engaged there, fueling the fight from the ground and in the air. -AMC aerial tanker support is responsible for more than 40 percent of the combined total of the U.S. Air Force aircraft sorties flown in support of operations of – in support of Operation Inherent Resolve. -AMC refuels fighters and bombers and those squadrons across the Pacific to ensure a constant presence in the Pacific, and refuels nearly all of our North Atlantic Treaty Organization allies during operations and exercises. - Great Tail Diplomacy achieves powerful effects.it means that anytime an Air Mobility aircraft lands in a nation abroad, it highlights the values and the resolve of the United States. When an aircraft from a partner nation lines up behind one of our tankers in air refueling, they see the American flag. -In the past year, we delivered over 362,000 tons of cargo, supplies, and humanitarian aid and more than 261 million pounds of fuel.